Good Friday and I'm usually in San Fernando, Pampanga. I spent my summers in San Fernando as a young kid and thus got exposed to the city's bloody rituals every Holy Week. Hundreds of flagellants or mamalaspas would pass in front of our house in the days leading to Good Friday. 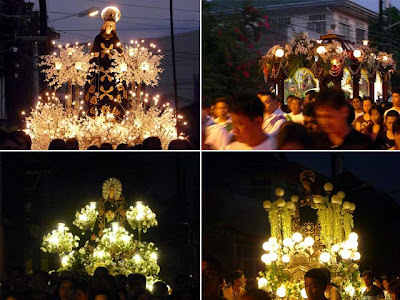 There are four kinds of penitents or magdarame in Pampanga. In San Fernando, most of them are mamalaspas, whipping their bloodied backs while making their way around the city. At times, we'd see a mamusan krus or a penitent carrying a cross in the opposite street with his band of tormentors making such a ruckus, pushing and hitting the poor soul. Then there are the magsalibatbat or penitents who crawl on the street, bearing the burning heat of the scorching pavement and hot summer sun. It was only recently that I've seen the kristos, penintents who are nailed to the cross, in Brgy. San Pedro Cutud (there are three crucifixion sites in San Fernando, the other two being Brgy. Sta. Lucia and Brgy. San Juan). The first time I visited Cutud, I told myself, it was going to be the last. It's dusty and unbearably hot at the burol. But I'm resigned to the fact that I'll be there often since friends always ask me to accompany them to the San Pedro Cutud Crucifixion Rites. So I found myself in Cutud again this year, this time with even more friends. We got back at our house at 3 p.m. and had a really late lunch. The solemn Good Friday procession of the Sto. Entierro makes its way around the heritage district at about 6 p.m. This is something which tourists should see as well. After the procession, we had sumptuous dinners (let me stress it's with an "s") at the different heritage houses, hopping from one house to another. For some reason, Good Friday in San Fernando is one big fiesta when families gather and meet. And while abstinence is evident in the feasts, fasting is not! Even during Holy Week, Pampanga lives up to its name as our country's culinary capital. 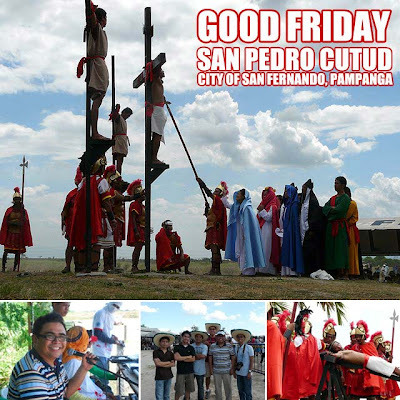 For more details on Cutud and San Fernando, Pampanga's Good Friday traditions, read Good Friday in San Fernando, Pampanga and Crucifixion rites held in San Pedro Cutud every Good Friday. Another great post. Your photos always make me feel as if I was there, even though I've never set foot in Pampanga or anywhere else in the Philippines. While that's about to change, as I'll be moving to Pampanga in May, I'll continue to use your site as my virtual tour guide as I explore the region. If I see you around San Fernando, I'll buy you a beer or two in return for the great insight and reviews. After this post and my wife's eyewitness account (she's also an American who just spent her first Good Friday in Pampanga and witnessed the mamalaspas), I can't wait for Holy Week next year. It's no American Easter parade, that's for sure. Hi Ivan. Your site on Cutud, makes me interested to visit the place w/my kids this Good Friday. We've seen flagellations of penitents only in Sn Fernando way back in the 90's. We planned to go to Cutud then, but since the kids were so young we de-toured our visit to Sn Fernando Church instead. Now, we intend to commute from Manila to Sn Fernando. Can you pls. give us details on how to go there and possible nice restaurants to visit and sample while we are within the vicinity? Thanks a lot for your beautiful and informative site. And thanks a lot too in advance for your help.